Acid Ape Chess 1.3 has been released. An eval gauge is now displayed next to the board during analysis or engine play; this gauge can be turned off in the settings page. Acid Ape Chess 1.2 has been released. 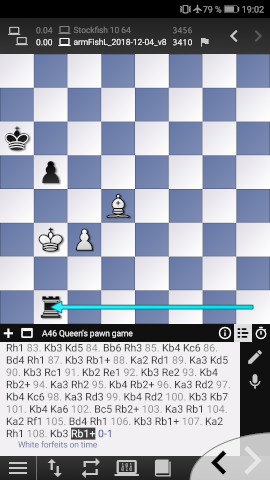 Games can now be auto-annotated (using a chess engine and the endgame tablebases). Game subpage layouts can now be saved and restored (long-press a game subpage title to access the subpages layout selection dialog). Engine evaluation scores can now be displayed as absolute values (positive when white is winning, zero when sides are equal, negative when black is winning) by disabling the Display relative score in the global settings page. Some annotated moves (!, ! !, ?, ??) are now colored in green, light green, red or light red. The DGT3000 sounds can now be toggled. The move speech recognition algorithm has been slightly improved. 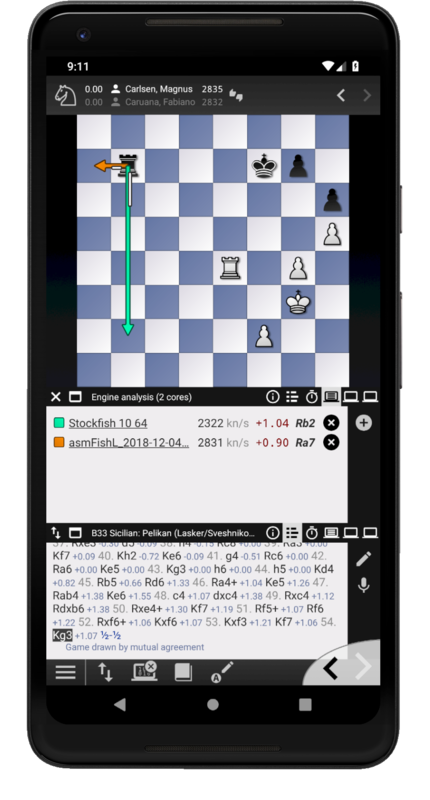 As can be seen in the last screenshot, Stockfish 10 believes that Fabi could have won this game, as he had a quite favorable eval when the draw was agreed. Acid Ape Chess 1.1 has been released. Physical board support: a stabletime algorithm (similar to the one in the DGT Rabbit Plugin) has been implemented; this eliminates incorrect detection of sliding moves on sensitive boards. Time control support has been greatly extended. A wide range of predefined time controls is now provided. You can also add custom time controls supporting multiple periods, move limits and Fischer increments. Engine and two-player games can now be adjourned and resumed later on. The flipped and clock at left physical board page settings are now saved permanently. Acid Ape Studios notifications (if any) are now periodically retrieved from our server and shown as Android system notifications (you can disable this notification channel in the Android system settings). Physical board support: kings can now be placed in two of the center squares to encode the game result. Physical clock support: opponent moves are now displayed on the physical clock. We would like to thank our users for their considerable support and encouragements following the release of Acid Ape Chess 1.0. We have received a massive amount of feedback (public and private). A lot of funny reactions, too. We have met amazing people from all over the world and this has been a very nice experience. We should write a long article about all this someday. We have hired a chimp to answer the Google Play one stars of a vocal minority of users that have decided not to purchase Acid Ape Chess Grandmaster Edition (which is of course perfectly ok) but find it absolutely necessary to grant us a one star about it, coupled with an (often unfactual) incendiary comment. We are proud that this vocal minority only ever complains about the price of our products (tells a lot about the quality we are able to deliver). 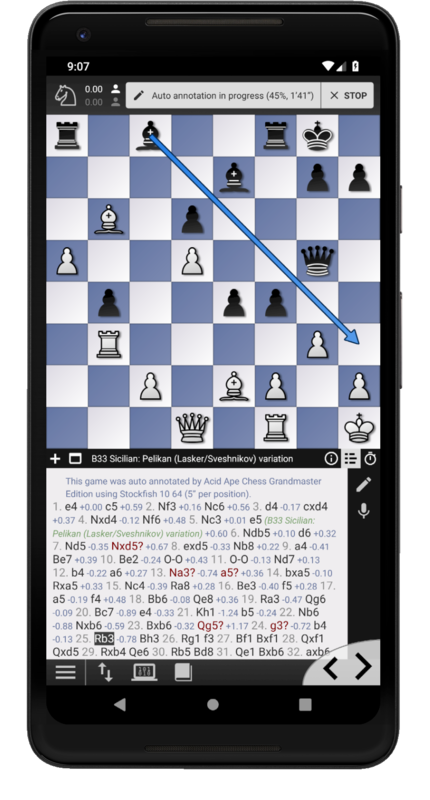 Today we have released Acid Ape Chess 1.0.3, which fixes some Android 9.0 network issues (online opening book, opening explorer, EGTB, etc). These were caused by the fact that starting with version 9.0, Android has changed a default setting, forcing all apps to update for that new default. 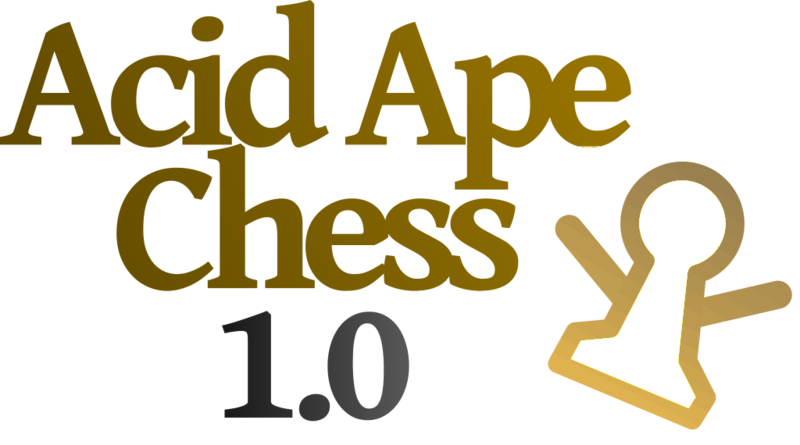 February 4, 2019 Acid Ape Chess reaches 1.0! Acid Ape Chess 1.0 has been released! Please note: to make Acid Ape Chess even better in the future, this release is using a free/paid model. 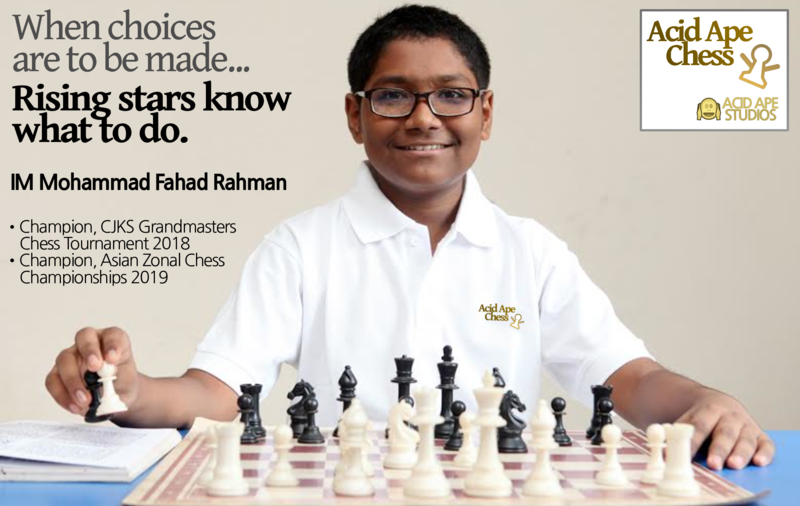 Some of the listed changes are to be found in Acid Ape Chess Grandmaster Edition. 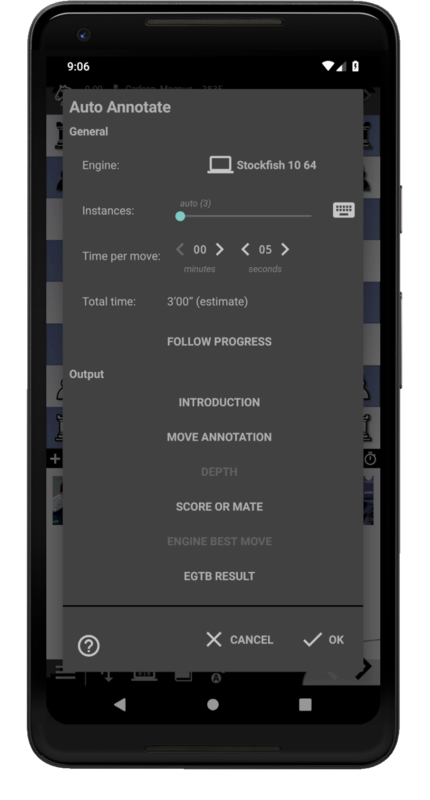 Chess Engines Collection version 1.3 has been released. 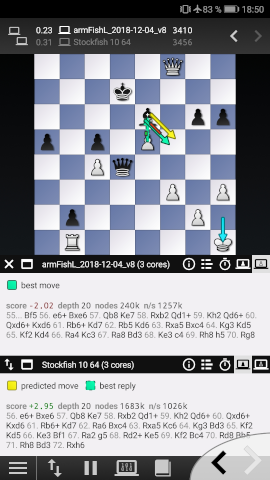 It features two updates: Stockfish 10 (the newest version of the strongest engine in the world at the time of this writing), and its assembler variant armFish. 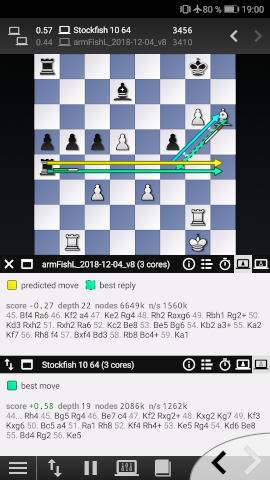 As part of our testing we have organized an interesting match between Stockfish 10 and armFish 20181204. 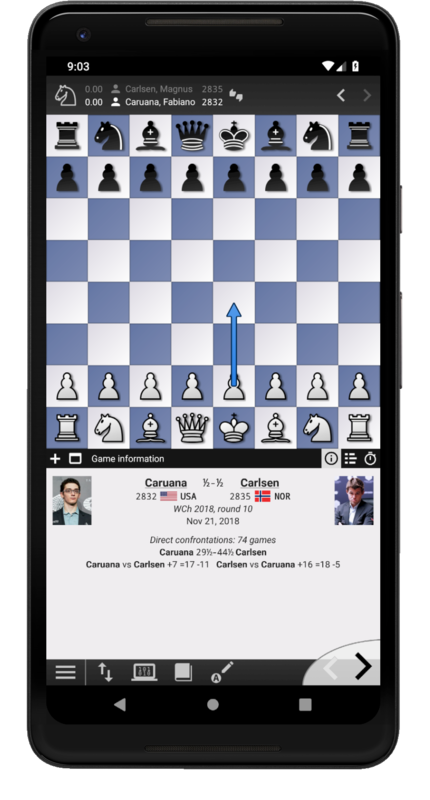 This match was played on a powerful octa-core phone. This means that each engine had 3 cores, since our core allocation algorithm ensures fairness (an equal number of cores for each engine) while keeping one core free for the Android system and other background apps. The match consisted of 4 blitz games with 5 minutes for each side and no increment. 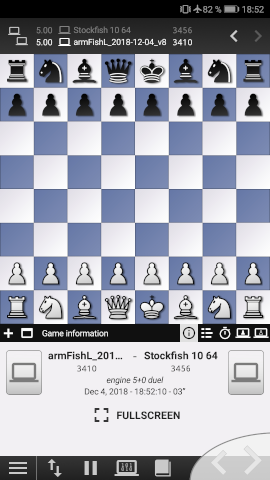 A coin flip decided that Stockfish 10 started the first game as white.